The Power Tool Challenge Team is back to share projects made with power tools. 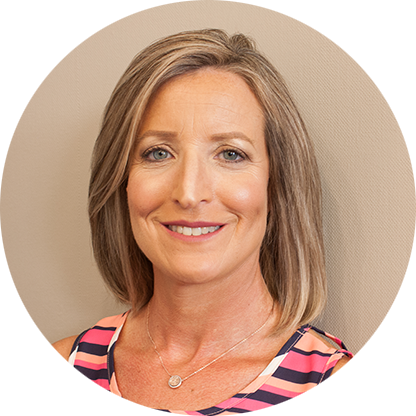 Our goal is to encourage ladies to get in the workshop and to use power tools. 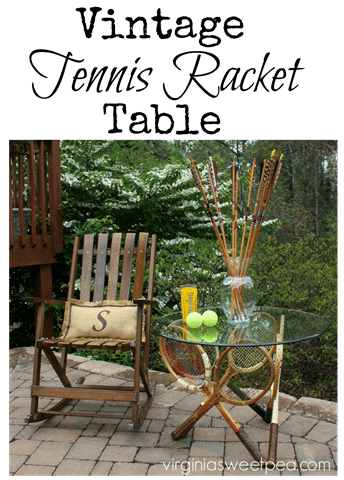 This month our theme is repurposed and I am excited to share how I used vintage tennis rackets to make a table base. 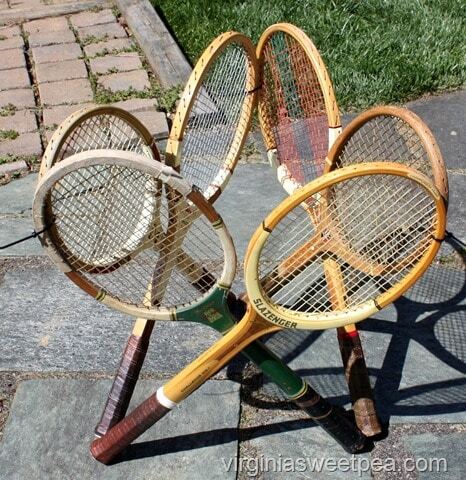 I started collecting wooden tennis rackets years ago thinking that I’d use them at the lake as wall decor. 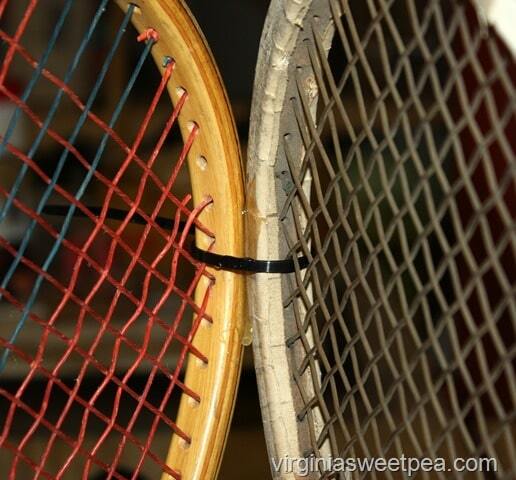 I still may execute that idea but loved repurposing these rackets into a table base. 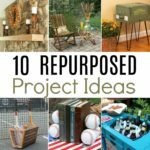 The Summer 2016 of Flea Market Style was the inspiration for this project. My table is built similarly to the one in the magazine but with a few differences. 1. Measure 12 1/2” from each racket handle base and mark a spot for a hole to be drilled with an awl and hammer. 2. 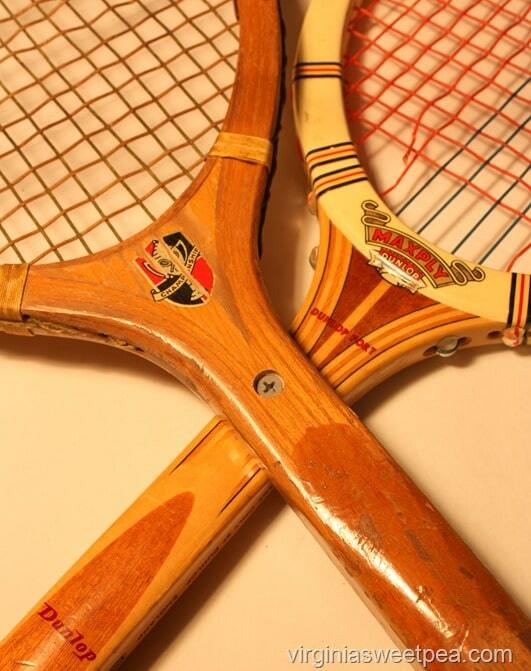 Pair the six rackets. 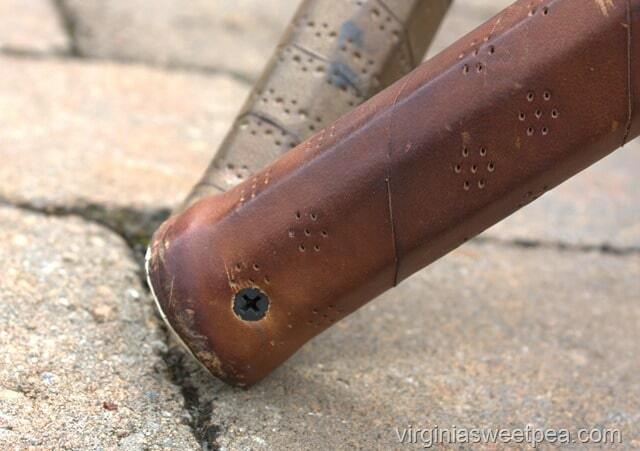 For each pair, drill a hole in one racket and countersink another hole in the other. 3. Screw pairs together using a deck screw. The rackets will scissor at this point making the height of the table top adjustable. 4. Decide on a desired table height; I chose 19 1/2”. 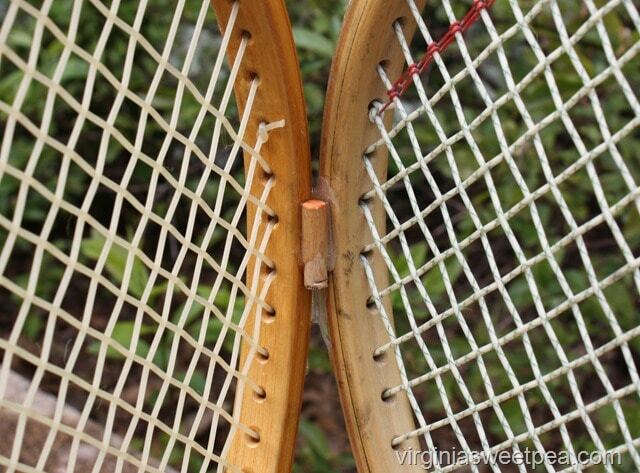 To set each racket pair to be 19 1/2” tall, build a jig by screwing or clamping two scrap pieces of lumber to a work area 19 1/2” apart in the center. 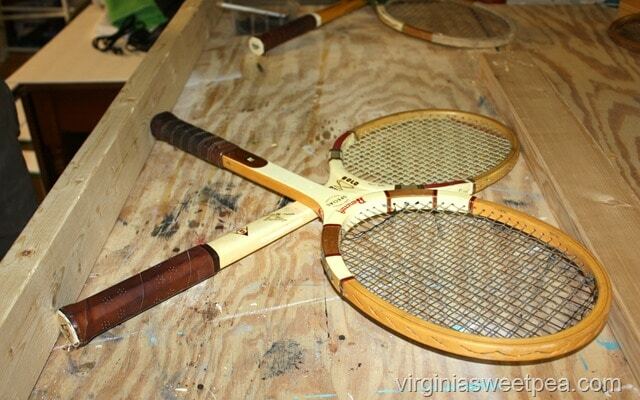 Place racket pairs into the jig and adjust so that the heads and handles of the pair will be 19 1/2” tall. 5. Add another screw beside the first one. 6. Group the three pairs of rackets to form the table base. 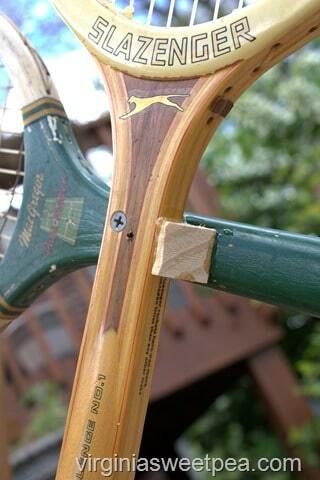 Use zip ties to hold the racket heads together. 7. 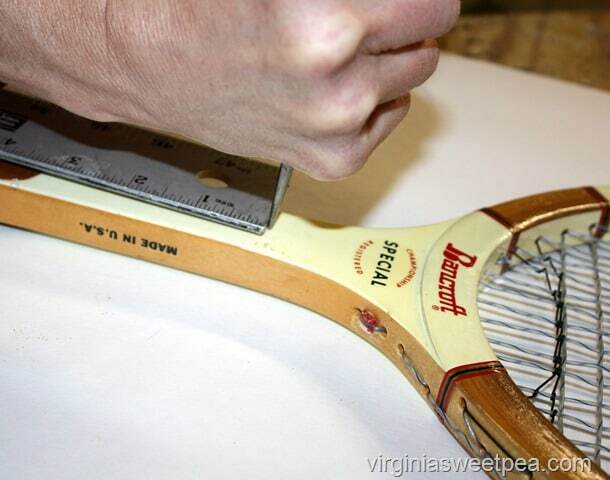 Mix epoxy and apply to each racket head junction. 8. 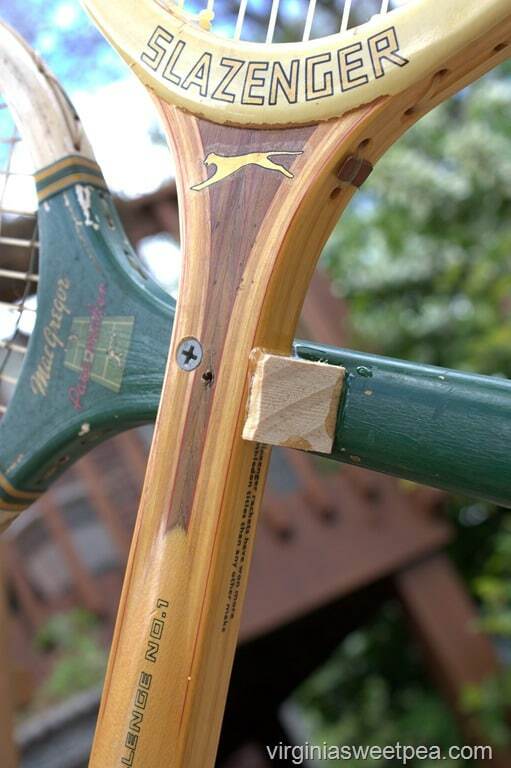 After the epoxy is dry, remove zip tie and epoxy a dowel scrap to each racket head junction for further support. 9. Cut a wedge shaped scrap of wood and epoxy into place under the handle below the screw where it will be hidden from view. 10. To make extra sure that the table would be secure, the racket handles were screwed together. 11. Carefully place the glass top on top of the racket base and enjoy your new table. The arrows were my dad’s and I even have their original quiver. This table has already been taken to our lake house where I know we’ll enjoy using it for many years. Since we have a lot of friends that play tennis, I think that it will be quite the conversation piece. Have you ever seen tennis balls that come in a glass instead of a can? 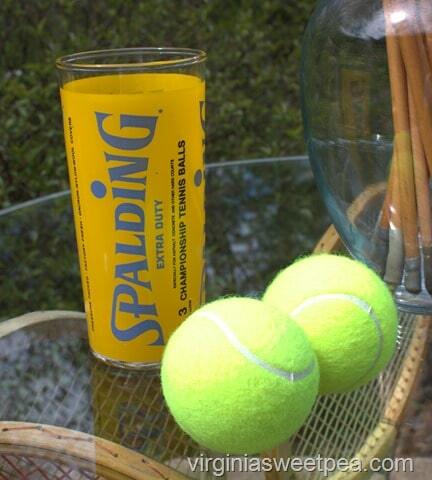 Spalding must have done that as a promotion at some point in the past. 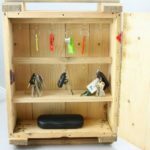 Please pin this project for others to discover! 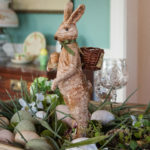 Now it’s time to see what the other ladies created for this month’s upcycle challenge. I am really looking forward to reading these posts! Click the links below to visit each project. How Clever! I love it! This table is too creative and out of this world awesome! 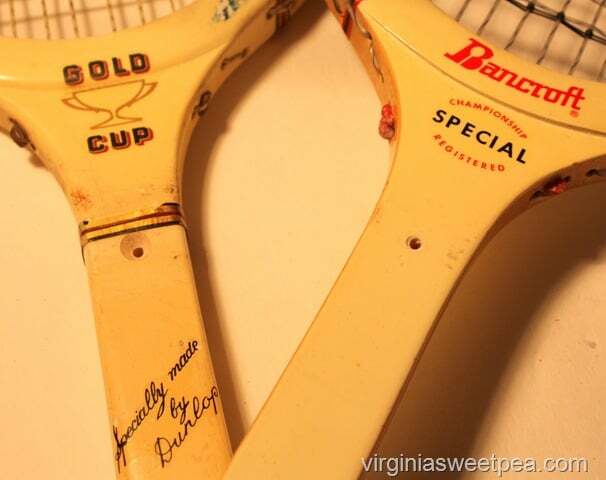 When my husband saw the pic, he kept saying how’d she conect the rackets? 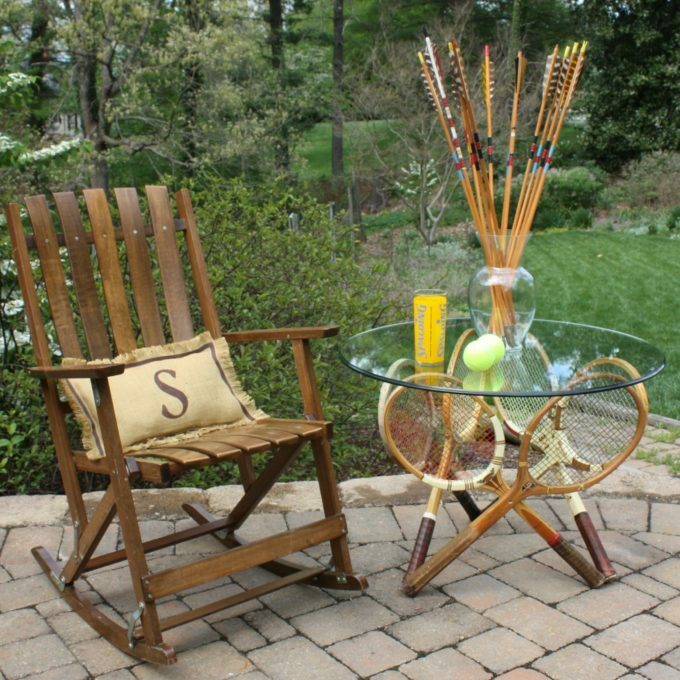 I have no doubt that this table will the talk of the get together when you have friends over! This is SO COOL! Even though I just read how you did this…how in the world did you do this? Haha! 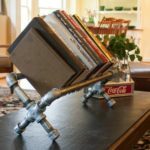 It’s such an awesome idea and just boggles the mind to look at. I love it! That is fabulous!!! I want one of those! The table is so pretty and very unique. Pinned! Wow Paula! This table is incredible! Your visitors are going to love it (and want you to built them one!) Pinned! 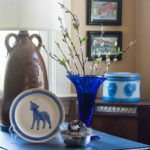 Paula, I love all the projects shared in this month’s challenge but when I saw your table, it is my favorite, hands down! 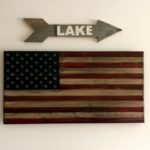 LOVE LOVE LOVE this conversation piece and I bet it looks fabulous at your cottage. Clapping hands over here – you rocked it! 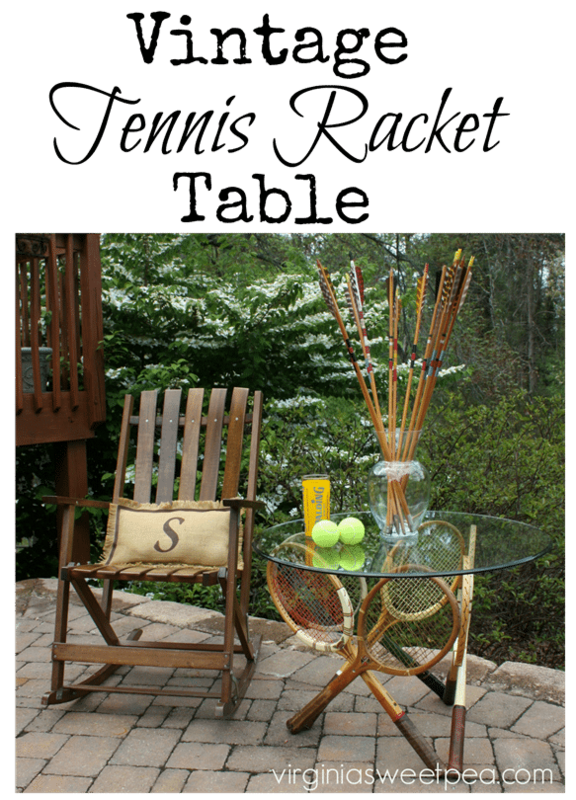 Paula, your sweet tennis racket table is my feature this week at the DIY Sunday Showcase Party! Wow, what a fun and cleaver idea! Seriously so awesome! I love it! So cute! I love the staging, too! Great photo all around! this is incredible!!! im so impressed! I just wish this were mine! You knocked it outta the court 😉 Love it and those arrows too! My birthday is coming up – in December! Oh my goodness! Such creativity! Love love love this unique piece. Wow! What an awesome table! Just stunning! 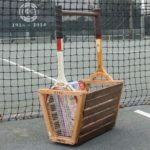 Makes me wish we had tennis players in our family who would really appreciate this! 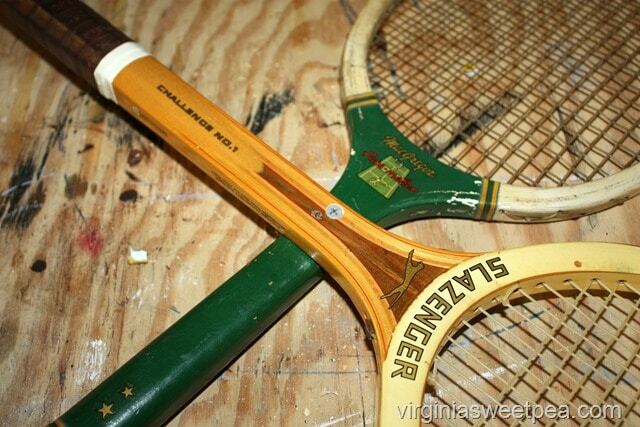 If I had a game room, I would be on the hunt for old tennis rackets today! 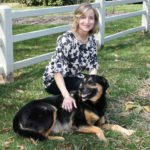 I would be honored if you would stop by and share this at Celebrate Your Story! link party! 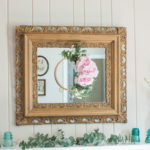 Here is the link: http://celebrateanddecorate.com/celebrate-story-24/ I have pinned this one to my Crafty Furniture board, I hope it inspires lots of others to take on this or a similar project! This is SO ingenious, I absolutely love it !!! Paula, you’ve outdone yourself on this project! This is brilliant!! As always, you give such good instructions for making one of these. We’re not tennis players, but I still just love this table. Awesome! I’ve never seen anything like this- so creative! I love how it turned out! 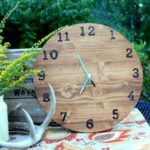 Thanks for linking up to the Handmade Hangout! 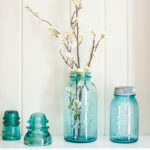 I’ll be featuring you on my blog (www.occasionallycrafty.com) when the new linky goes live today at 6pm ET. I hope you’ll stop by and link up again! 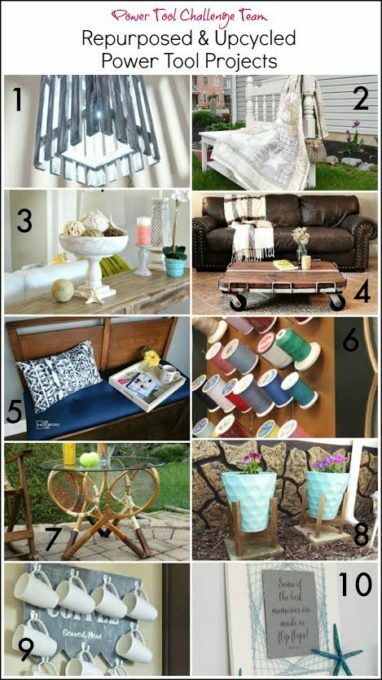 Paula..this table is so fantastic!…so creative and fun!…Great tutorial….I must pin and share today!!!! How incredibly cool is this table! What a brilliant idea! I love how your mind works! Well done! I hope you have a great day! Wow! 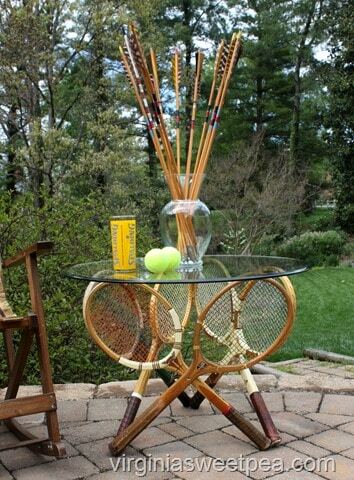 I love this repurpose of the tennis rackets! You really nailed this one! WOW!! What a brilliant idea.so creative.I;ve never seen anythings like this design.Love this kind of unique style. Thank you! 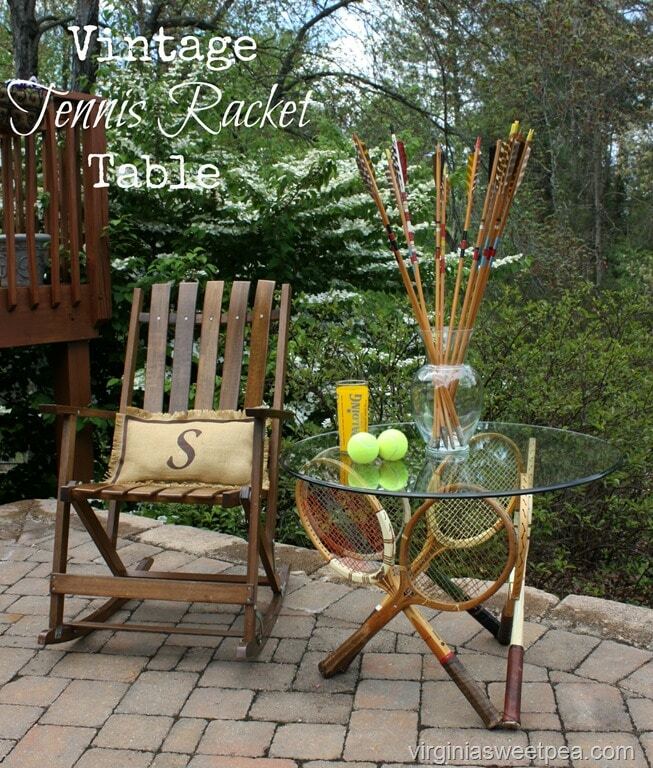 We play tennis, so this table is perfect for our home. 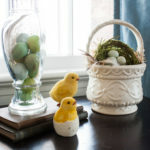 When we have visitors, they almost always comment on this table.